Беккер Рихард - Родился 29 апреля, 1959 в Брементоне, США, жил в Сан Диего. В 1974 переехал в Штат Орегон, где и проживает с тех пор. Работает в космической промышленности. В 1977 г выиграл Первенство Штата Орегон среди юниоров. Richard Becker - I was born April 29, 1959 in the Bremerton, WA, naval hospital. I grew up in San Diego where my father was stationed for most of his naval career. In 1974, my family moved to Oregon where I have resided ever since. I had an aptitude for mathematics and I studied engineering in college, but never graduated. Presently, I am employed in the aerospace industry where my duties involve inspecting, measuring, and testing investment castings. My father taught my four brothers and I to play chess when we were children. In 1977, I won the Oregon Junior Championship. 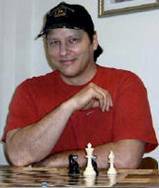 In 1986, I became the only member of the Oregon City Chess Club to win the Oregon City Open Tournament. Not bad results for someone who never studied openings. All my chess study time was spent composing.